Street art site Wooster Collective summarizes (then alters the story for accuracy here) recent happenings in the world of corporate graffiti. 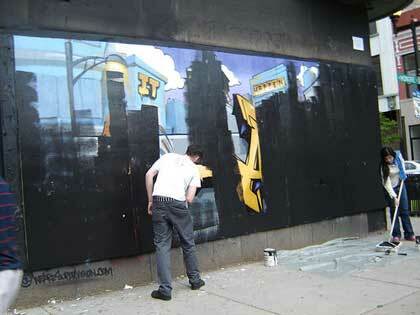 Recently Time Magazine paid CopeII to create a graffiti billboard in New York. Earlier this week a graffiti artist was arrested in Chicago for buffing - covering up with black paint - another graffiti artist's work, commissioned by Critical Massive, for Axe Deodorant. This has caused a battle within the graffiti community. Graffiti wants to be art. Not commerce. But even natural graffiti artists need to make a living. Not to mention ad agencies which can't leave a single inch of potential media space untapped. Running a company that has a Legal Graffiti Advertising offering (www.altterrain.com/graffiti_advertising.htm), we take great strides to not only ensure branded murals engage consumers, but also the local graffiti culture/community, as they are often more important/influential than the general public. this story is a bit confusing, and there have been some rewrites and clarifications written on wooster and on soem blogs. basically people are reacting to the co-optation of "street" culture and there is a growing concern about the privatisation of "public" space and the criminalisation of public art. companies hiding behind the notion of supporting the arts and using graffiti kids to sell products has officially backfired in Chicago and will spread to other cities soon. there is a dialogue about the Axe billboard issue located ::"
you will have to plow thru some inane comments to get to the juicy bits. Graffiti has been co-opting marketing messages for years, and now that a few trustafarians are upset because they think they are the only ones entitled to deface others' property. Their sycophantic friend Liz who writes for The Reader is less a journalist and more of an elitist sub-socialite who can't write anything unless it's putting one of her pretentious friends on a pedestal. This is more a case of spoiled, self-entitled brats who simply can't take that which they dish out every day (or every day they're sober enough to do so... yes, Lumpen, I'm talking about you). The ones who really need luck are the irrational hipster wonks who need to spend more time bathing and less time demanding that their opinion is the only one that counts, or that Wicker Park somehow belongs to them just because they rent a couple crappy "gallery" (read: total dive housing) spaces there. This is not the "war" that has been implied in the discussions Mr. Wiggles linked to -- those are discussions run by friends of the folks who painted over the "corporate" graf.